Love is in the air! And the backyard! At DutchCrafters we offer a wide variety of American made benches that are perfect for the outdoors. 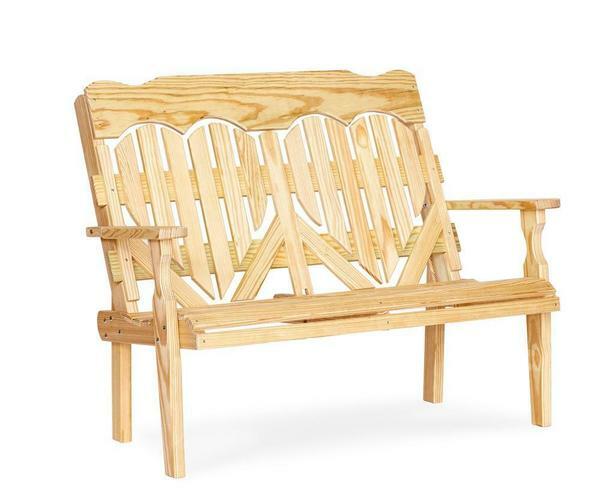 This pine outdoor wood bench will add a touch of romance to your garden, front porch or patio. This pine wood bench is sure to transform your outdoor space. This is also the perfect bench for a business outdoor space such as restaurant outdoor waiting spaces. Please call 1-866-272-6773 with questions on our Amish patio furniture or this heart bench. Please note that some easy assembly may be required. The amount of hearts on the bench will vary depending on the length. Kari-Jo you made my day!! Thank-you for kindness in responding!! Have a great day!! !